Terrain designed a large public amenity rooftop, private terraces and the lobby courtyard as part of the conversion of a historic, Tribeca office building into new residences. The conversion was commissioned by HFZ Capital Group and led by BKSK Architects. The design of the rooftop responds to the strong presence of architecture and mechanical infrastructure at the terrace level. The large, L-shaped space is fragmented into smaller, irregular spaces by private penthouses, stair and elevator bulkheads, mechanical banks and finally a large light well for the apartments below. In response to these spatial challenges, Terrain developed a planting and material strategy to clarify and order the roof terrace. Large groves of birch trees shape clear garden rooms while a 3 type paving language distinguishes circulation apart from large gathering and intimate spaces. A limited material pallet, driven by a harmony with the architecture, reduces the number of surface treatments while carefully crafted tiers of planting create softer, more verdant spaces. 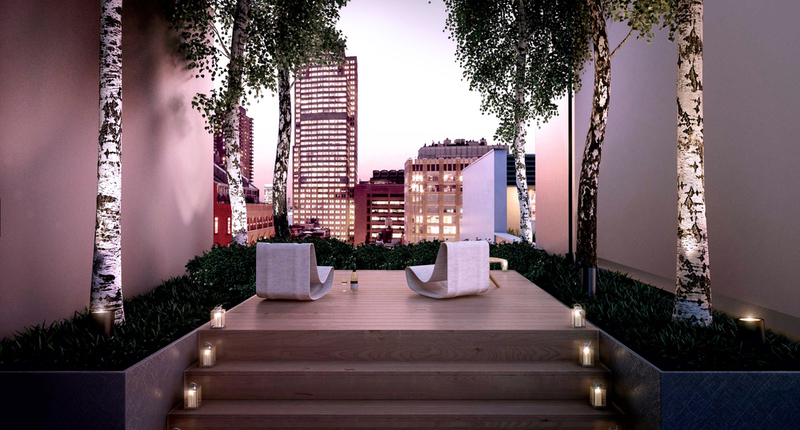 In total the rooftop consists of a large, communal kitchen lounge, a Hudson facing sundeck, a raised meditation platform framing views of the city-scape, and two large, southern facing private penthouses. In the courtyard, Terrain & BKSK developed a sculptural, undulating surface of glass, stone, and muscle wood grove at the bottom of an 11 story light shaft.